I want to share a special photoshoot from last winter with you. In March, 2018 I got a message from Robert from New York, who wanted to surprise his girlfriend Sabrina during their stay in Rovaniemi. 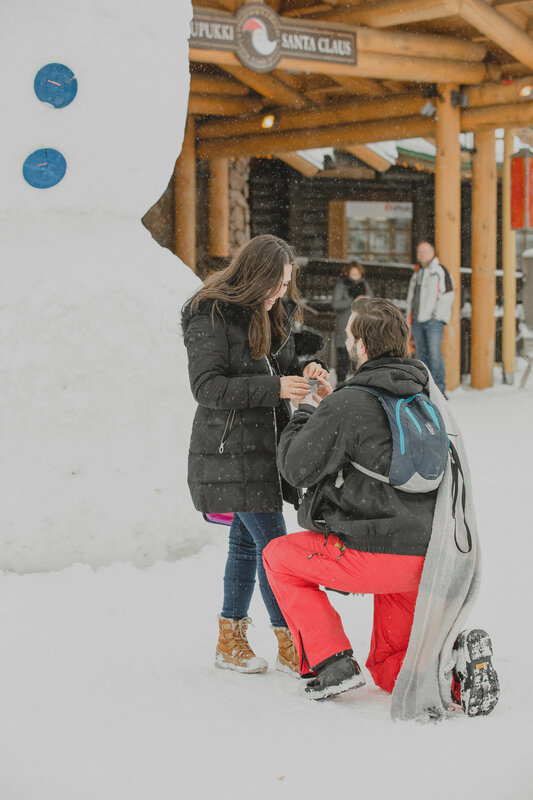 He asked me to photograph his surprise propsal at Santa Clause Village at the Arctic Circle in Rovaniemi and to take their engagement pictures afterwards. I was very excited and happy to do the photoshoot. Robert send me some pictures of them before the big day, so I would recognize them. Santa Clause Village is a place that is filled with people and cameras, so I didn’t actually have to go and hide in any bushes. Robert told me that he normally isn’t very romantic, but this is a super romantic idea in my opinion! On the day of the photoshoot it was beautifully snowing and I quickly spotted Robert and Sabrina at our meeting point. I had sent Robert some pictures of the place beforehand, so we would easily find each other. And she said yes! The surprise was a success and we had such a beautiful photoshoot at Santa Claus village and close by at a local reindeer farm. I’m so lucky to have met this wonderful couple. The best part of my job is meeting such nice people, from around the world. Are you planning a trip to Rovaniemi or Lapland, Finland? I would love to help you plan a unique photoshoot in this winter wonderland!